Amir Khan on Tuesday drew the admiration of his next opponent, the American Lamont Peterson, for having agreed to face him in his home town of Washington DC. Khan will defend the World Boxing Association and International Boxing Federation light-welterweight world titles at the Washington Convention Centre on Dec 10 against Peterson, a fighter who is equally happy to box or stand toe-to-toe. Schaefer revealed that the event would be shown on HBO in the US, with the convention centre set up for a capacity audience of 12,000. However it is not clear yet whether Khanâ€™s management team will stick with pay-per-view channel Primetime or switch back to Sky Sports after bitter wrangling between Khanâ€™s team and the broadcaster over coverage of the Paul McCloskey fight in April. Khan, who will be 25 two days before this fourth fight in America, explained: â€œIâ€™m always fighting on the road, away from home, Iâ€™ve fought in New York, I fought twice in Vegas, it makes me train harder when my opponent is the main attraction or has the most support, I want to win the fans over wherever I go and become a global name. â€œI leave for Los Angeles next week and training camp with Freddie Roach, who has cut short the camp with Manny Pacquiao in the Philippines to fit me in with the plans. 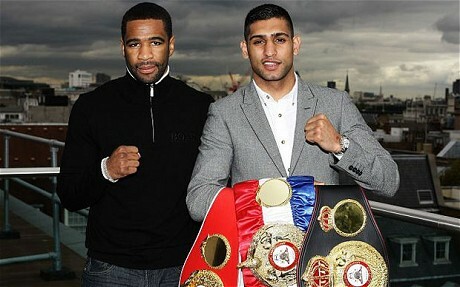 Meanwhile, GB boxers qualified in four weight divisions on Tuesday for the London 2012 Olympics. Light-welterweight Tom Stalker, bantamweight Luke Campbell and welterweight Fred Evans are all guaranteed places after reaching the quarter-final stage of the World Amateur Boxing championships in Baku, Azerbaijan. Flyweights Khalid Yafai and Andrew Selby also progressed to the last eight, meaning GB will definitely have one flyweight competing at London 2012. However, the pair could end up having to box off for the one 52kg place.